Discuss the social culture of the novel by Wharton. Examine the current events that were significant to the era in which the novel was written. 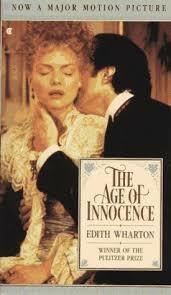 Explain what the title "Age of Innocence" says about the novel. Newland Archer and May Welland comprise a “society marriage,” one that was arranged and carried out for the sake of doing what was polite and appropriate. Unsurprisingly, the marriage of the two is loveless and empty, and it is only when May becomes pregnant that Newland forces himself to remain in such an arrangement. Unlike May, Ellen is the vision of the modern woman; she left a bad marriage to a Polish count, bringing shame and dishonor to her family. She is shunned by many, but her cousin, May, and her fiancée, Newland, accept her. The latter finds himself falling in love with this woman, seeing her as something markedly different from the conventions he was used to. He even went so far as to ask his fiancée to move up their wedding date, hoping that going through the ceremony would remove his infatuation with Ellen. When the two eventually marry, Newland finds that his feelings do not dissipate. The climax of the story comes when Newland is prepared to leave his wife to pursue her cousin who had just returned to Europe; just as he is about to tell May of his plans, she interrupts him with the news that she is going to have a child. The reader can only presume that Ellen left America to prevent him from doing this, having been told that his wife was pregnant just a few weeks earlier. The story closes by looking a quarter-century into the future; May has died, and Newland travels to Paris with his son. When he finds Ellen’s apartment, he sends his son upstairs to speak with her. Rather than encounter her, though, he merely walks away, back to his hotel, content in only remembering what could have been. History of New York City - History of New York City Research Papers open up at the 19th century discusses important facts. Demographics of New York - Demographics of New York Research Papers delve into an example of an order placed on how the town/community is set-up in terms of politics, law enforcement and even the history of the town. Feminism - Feminism research papers overview women's rights and the feminist movement. Marxist - Marxist research papers examine the individuals who ascribe to the political and economic theories espoused by the 19th century German philosopher Karl Marx. Fixing Families - Fixing Families Research Papers look at a sample of an order placed on a book summary and critique with specific questions to respond to. Irony in The House of Mirth - Irony in The House of Mirth research papers exaine the life of Lily Bart and how Edith Wharton weaves irony throughout the novel. Brooks' Irony as a Principle of Structure - Irony in The House of Mirth research papers exaine the life of Lily Bart and how Edith Wharton weaves irony throughout the novel. Billy Budd - Billy Budd research paper discuss the plot of the novella written by Herman Melville. Foreshadowing and Irony in Flannery O'Connor - Irony in The House of Mirth research papers exaine the life of Lily Bart and how Edith Wharton weaves irony throughout the novel. Trifles by Susan Glaspell - American Literature is studies by nearly ever student that passes through college. Bananas, Beaches, and Bases - Bananas, Beaches, and Bases Research Papers go into the symbolism of these terms, and the different ways that men in power have exploited women. A Jury of Her Peers Analysis - A Jury of Her Peers Analysis examines the short story by American author Susan Glaspell. Female Oppression in a Dolls House - Female Oppression in a Dolls House Research Papers are about Henrik Ibsens European Drama from the ninteenth century and Nora's life. Character Analysis in Little Women - Character Analysis in Little Women show the transformation of Jo as a failure of a woman’s independent spirit or a triumph of domestic life. Themes in Little Women - Little Women research papers discuss the book that contains several themes that mostly revolve around the issues of a woman's place in life and morals. Little Women - Little Women Research Papers explore the lives of the four main characters of the book Meg, Jo, Beth, and Amy March, who were all sisters. Paper Masters writes custom research papers on Wharton Age of Innocence and explains how the novel demonstrates the changing morals and assumptions about New York society in the 1870s.